After 12 years of running Claridge’s on-site fine-dining restaurant, celebrity chef Gordon Ramsay handed over the reigns to Simon Rogan, who opened Fera in May. 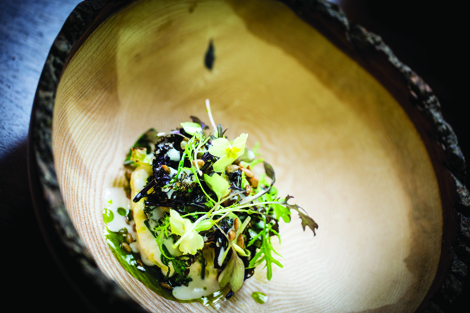 Rogan is a renowned British chef who takes a technical approach to food and is deeply inspired by nature. He opened his first restaurant, two-Michelin starred L’Enclume in the Lake District in 2002, and also has a culinary research kitchen, Aulis, which is where his farming and forgaging programmes are co-ordinated, and his culinary experiments are conducted. He also has a five-hectare farm in Cumbria’s Cartmel Valley. Fera (which means “wild” in Latin) is a continuation of Rogan’s passion for seasonal ingredients and the English countryside, with menus that change with the time of year and incorporate high quality, carefully sourced components – many of which you won’t have come across before. Many herbs, flowers and vegetables used are grown on his farm or in the kitchen (look out the window and you will see an “urban meadow”), while other components are brought in from small-hold, artisan suppliers (strawberries from Hampshire, slate platters from the Lake District’s Coniston and venison from the Holker Estate, for example.) The cutlery is by Studio William, and the handmade ceramic plates with subtle double glazes are from North Street Potters in London’s Clapham. The interiors of the restaurant have also undergone a transformation, the white tablecloths replaced by naked walnut wood, and the décor no longer purples and pinks, but a muted palette of soft olive green, grey and earth brown. 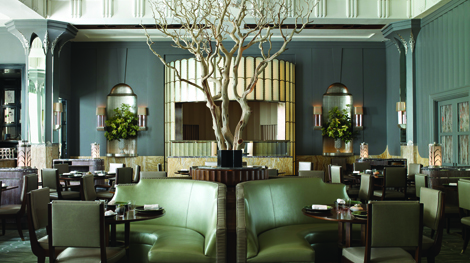 On the tables are pebbles for holding candles and menu cards and, in the centre of the room, a twisted leafless tree reaching up to the high art deco ceiling. My impression was of a masculine space with feminine food. Staff are dressed in less conventional uniforms: stylish black dresses with twisted gold necklaces on the women; and dark suits, white shirts and ties on the men, several of whom sported hipster beards. While on the face of it, Fera is less traditional than Gordon Ramsay at Claridge’s was, the service and experience is still very formal. Diners are greeted and seated on arrival, there is a sommelier to advise on wine, and young chefs bring each dish out personally to the tables – even Simon Rogan is there to do the honours. When I arrived at 6.45pm on a Tuesday, the restaurant was fairly quiet but it soon filled up – note that it can be a challenge to get a reservation so book well in advance. The waiting operation is slick, in fact it’s so well-run that the dark-suited staff reminded me of a secret service team silently moving about – focused, choreographed and highly organised. When serving at the table, though, they are charming, informed and chatty, going into great detail about what you are about to taste, if so required. 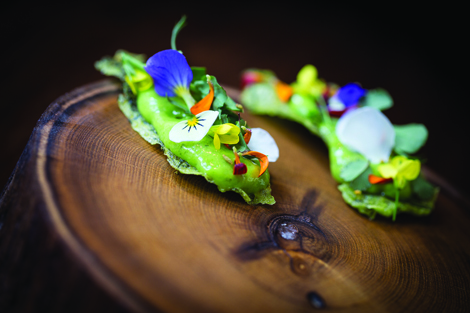 For more on Michelin dining trends in London, subscribers can click here to read “Star quality” from our July/August issue. The modernist, back-to-nature cuisine at Fera is incredible, at times defying written description because of its complexity. What’s more, it is far from gimmicky, with virtually every dish a captivating delight, pleasing the eye in the delicacy and artistry of its presentation, and arousing surprise and curiosity in the flavours and ingredients used. Portions, you will be glad to know when embarking on a tasting menu, are tiny – that said, they are plentiful, with so many morsels presented that it’s easy to lose count of how many things you have eaten and what is to come next. (What’s nice, though, is you get your own small version of the menu on a card in a wallet, which you can pull out to reveal each course as you are served it.) A 16-course meal can easily take 3.5 hours, so you have to be able to commit to the experience, and bring your appetite. Instead of being served a basket of bread at the beginning of the meal, which always spoils your appetite and yet is so hard to refuse, Rogan has created a bread course, which is served between the smaller and larger sections of the tasting menu. It comes in the form of a perfect hunk of freshly baked loaf with home-churned, salted butter and a pale stone cup with an inch of savoury mushroom broth in it. Just wonderful. Then there were two prawn cracker-style wafers sprinkled with Berkswell cheese and pickled plum powder place on a box of small smooth pebbles; a couple of posh deep fried onion bhaji-type bites; and a heavenly petite earthenware bowl of Winslade and potato – a cross between a rich cheese mousse and a fondue topped with teeny pieces of potato skin and a miniature purple flower. The six wine pairings began next (I had finished my cocktail before all the appetisers were consumed so went for about 45 minutes without anything but water). This was the selection chosen by the sommelier for each dish that was to come next. My first “main” dish was an a miniature pile of delicate shaved sweetheart cabbage and smoked broccoli cream in a pool of zesty apple juice presented in a duck-egg blue, oyster-shaped ceramic bowl. After a mouthful of wafer-thin asparagus with pickled Alexander (an edible wild flower), which I am told goes beautifully with the prawn, Simon Rogan popped out with a hand-hollowed wooden bowl (the bark still trimming the rim) of crispy salad leaves grilled over embers with sprigs of yellow flowers heaped on to a rich cheesy, truffle custard. Eaten with an oversized wooden fork, it was a gloriously bucolic experience embodying wood smoke from campfires wafting over the fields. Next up were little braised pieces of artichoke and red beetroot under a pink sauce of dulse (red sea lettuce) and leaves of sea campion (a coastal flowering plant related to the carnation), finishing with a carefully constructed teepee of celeriac baked in hay, crispy skin, king oyster mushroom, turnips, hazelnuts and baby white radishes. Thankfully, being the vegetarian menu, everything was relatively light, there being very little in the way of carbs to fill you up. The desserts were delightful, iced sorrel bringing back childhood memories of my dad picking strands of “seedy sorrel” from the sides of country lanes for my brothers and I to chew on (it’s a kind of tangy grass). The blackberry soda in a deceptively tall cup was equally Proustian in its vivid colour and flavour, while the pineapple weed and butterscotch went surprisingly well with the celery ice cream. The meal ended with Rogan’s version of petit fours – hazelnut jellies and clouds of sweet, edible “moss” (green sponge cake? ), which tasted like aniseed and had weeny white flowers placed on top. A treat fit for any Cornish sprite. I appreciated the specialist tea menu (oolong, herbal, black, green and white from London’s Postcard Teas and the Rare Tea Company), ordering a pot of peppermint with water presented in a clear, thermal glass bottle to pour into a perfectly hewn ceramic pot. An egg timer was also provided to show when the infusion was ready to be drunk. 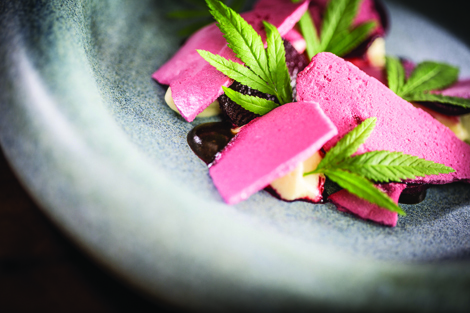 Simon Rogan and his team of talented chefs are producing modernist cuisine at its very best – artistic, delicate, humble, sensitive, imaginative food from the heart of the English countryside. There is a little bit of molecular gastronomy going on too, but not so much that there are clouds of liquid nitrogen to overwhelm the experience. The dining room itself is bordering on austere – it’s quite a serious place, but this is food that commands your attention. You have to contemplate and appreciate every morsel you are confronted with. The menu is a bit confusing so you will probably need guidance (and considerable explanation if you want to know what all the ingredients are) but staff are happy to talk you through it. If you are having a tasting menu, which is recommended, be prepared for it to take up a whole evening. Fera is expensive but it succeeds in serving food to be remembered – the best vegetarian cuisine I have ever had, so I can only imagine how good the meat is. 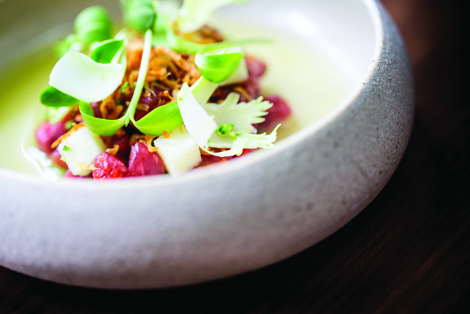 Fera may, however, struggle in getting repeat custom from Londoners as the magnitude of the dining experience cannot be taken on with regularity. OPENING HOURS Lunch 12pm-2.30pm, dinner 6.30pm-10pm daily. PRICES Three-course set lunch £45 Mon-Fri; three-course à la carte £85; tasting menu (ten or 16 courses) £95/125.